Mount this to fire a hail of Advanced Rifle Bullets at your enemies. Powered by the rider. The Minigun Turret is a stationary turret that fires Advanced Rifle Bullet. 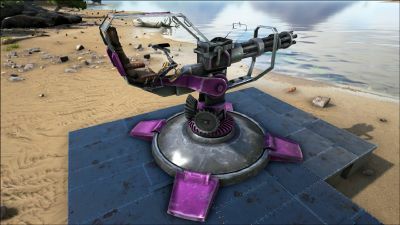 Players must mount the turret to control and fire it. The Minigun Turret's color regions 3 and 4 are unpaintable. 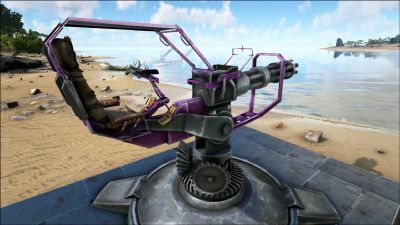 Note: the Minigun Turret is NOT bugged, you MUST aggro the untamed target dino before attacking it with the minigun turret. 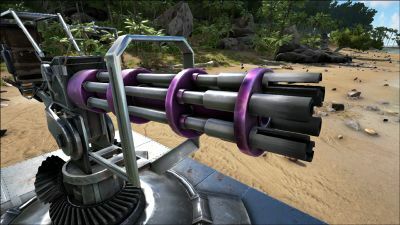 It functions as a normal gun against unallied humans and tamed dinos. 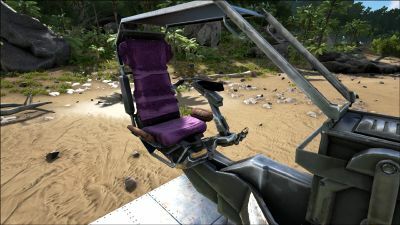 The weight of the materials is incredible and will quickly encumber even the largest of dinos that aren't designed to take the load, even encumbering low level brontosauruses. The Minigun Turret is much lighter once assembled. The accuracy of the Minigun turret is comparable to that of the assault rifle when fired in small bursts. 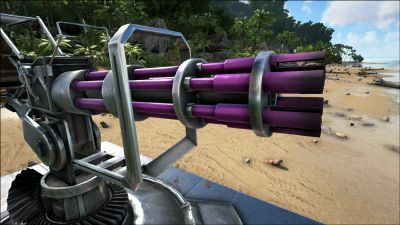 When aiming the Minigun, contrary to first impressions the center of the sight is not where bullet will hit, instead it is better to aim with the tip of the vertical arrow. 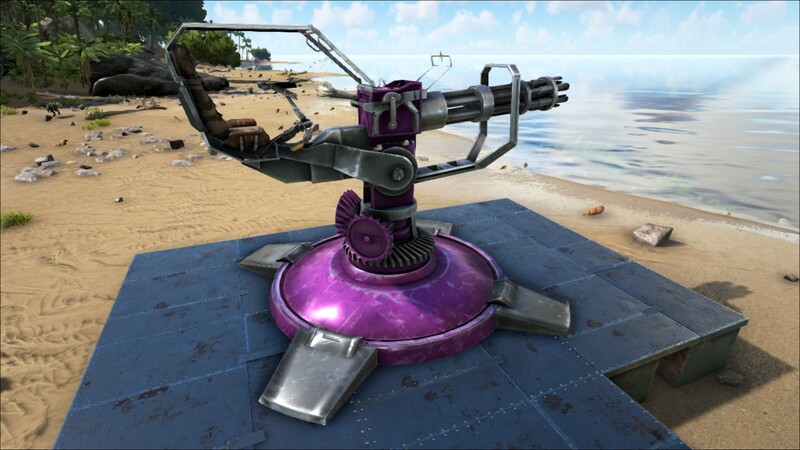 Do not place the Minigun Turret too close to any unbreakable rock walls or else you will be kicked off the turret if you rotate into the wall and you will have no choice but to destroy it. The Minigun Turret does enough damage per second that it can quite effectively counteract the 250 hp a second regen of the DodoRex, though this is very costly, and would probably require backups since the DodoRex can damage the turret. The Minigun Turret works underwater, feel free to mount it on top of a tamed Plesiosaur.